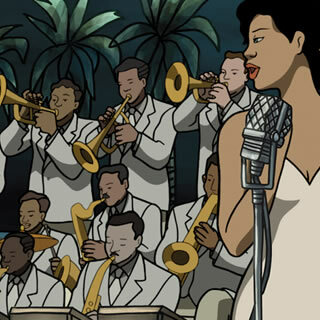 This animated romantic fantasy is the story of star-crossed lovers set against a backdrop of the post-war jazz scene linking Cuba and America. 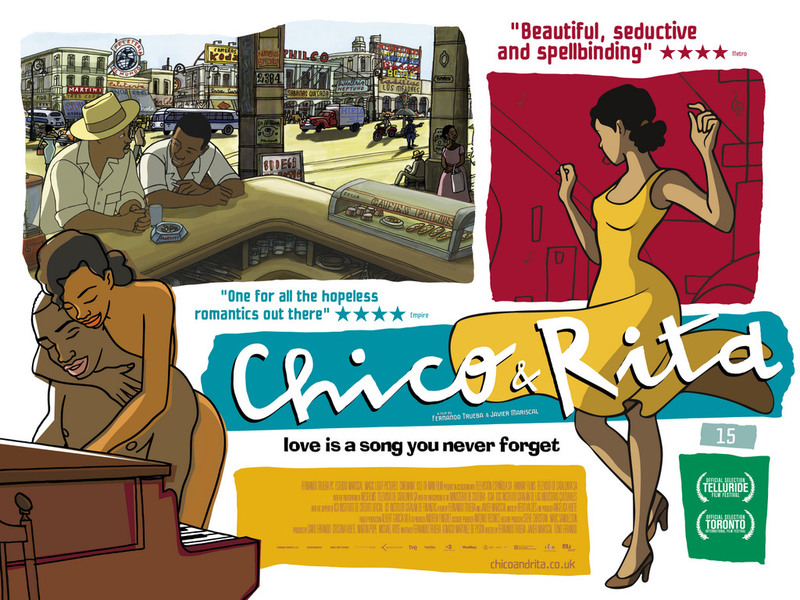 Chico and Rita (2010) chronicle’s the story, in flashback, of a gifted piano player and a beautiful singer and their adventures in 1950’s Havana, Las Vegas, Hollywood and New York. The movie opens and we observe an old man earning a living in the streets of Havana as a shoeshine man, at the end of his day we see him return to his box like flat and turns on a radio, he instantly recognizes the song that’s playing transporting him back to his younger days. 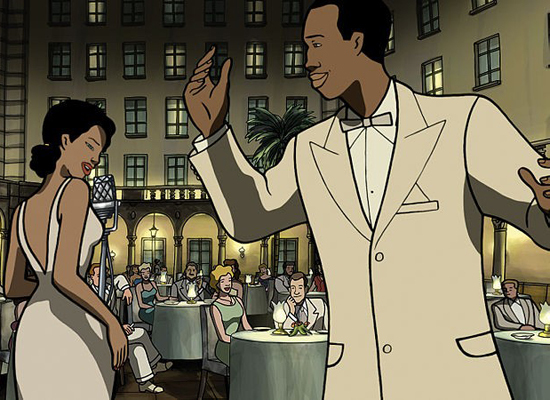 We discover that the man is Chico, reputedly the finest pianist in Havana, who is looking for a singer of some repute to join him in a talent competition. One night he meets a beautiful girl in a yellow dress, the gifted singer Rita with whose help he wins the competition. They fall deeply in love, but as we all know true love and fame do not always make for a good relationship therefore it would seem that their association was doomed from the start. Rita becomes a big star on Broadway and in Hollywood performing in the biggest venues but unable to sleep in in the same hotels as the posh white folk that adore her so much because of the colour of her skin. Chico meanwhile ends up on a tour across Europe with jazz giant Dizzy Gillespie. The problem is that Rita is under the control of a manipulating manager who thinks that Chico will influence his star to leave him and join Chico in a life of domestic bliss so consequently drugs are planted and Chico is deported back to Cuba with little possibility of leaving the country to rejoin Rita at any time soon. This beautiful life affirming love story is a wonderfully crafted film obviously made by people that take a great pride in their work. Jointly directed by Spaniard Fernando Trueba and artist Javier Mariscal it has a superb soundtrack by Cuban pianist Bebo Valdes featuring numbers by jazz greats Thelonious Monk, Cole Porter and Dizzy Gillespie. This is animation at its very best and I agree whole-heartedly with the Spanish film magazine Fotogrames when it praised the characters as being “more human and alive than many real actors” its so well done that you completely forget that the on screen characters are not real people. Beg, steal or borrow but see this film.